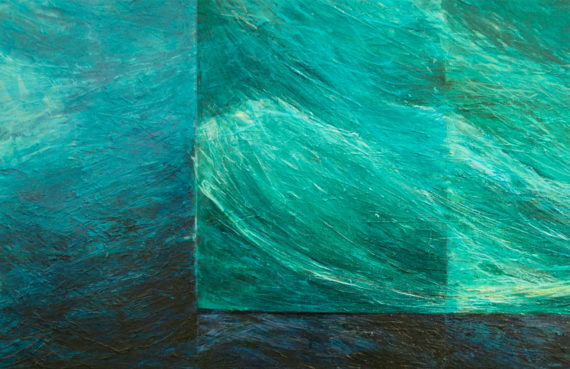 The Uncertain Sea is a solo exhibition by Pilar Cortes that brings together a selection of landscape paintings produced since moving to the UK. Concerned with the idea that a landscape is a reference to a specific place, her work is inspired by what Marc Auge defines as ‘non-places’ – transitional locations that do not deserve to be considered as a proper place because of their anonymity. Taking photographs of the elements for inspiration, her most recent work fragments the canvas with different segments and perspectives. Realistic images become abstractions removed from a place. Since graduating in 2007 with BA in Visual Arts from the National Autonomous University of Mexico (UNAM), Pilar has been based in Bristol since 2008, working from her studio in Coexist, Hamilton House for the past six years. After the upheaval caused by the building’s owners, she recently relocated to Mivart Studios. Her work has been exhibited widely throughout more than 30 exhibitions in Mexico, Colombia, the UK and Spain. Highlighted shows include 2005 Women in Mexican Fine Arts, Museum of Mexico City; 2017 Threshold Festival, Unit 51, Baltic Creative, Liverpool, UK; 2014 Fascinate digital arts Conference and Showcase, Falmouth University and 2018 Camaradas, Espacio Gallery, London, UK.